Internet access is available to anyone using the public computers in the building. Children, 13 and under, may use the computers in the Youth Department. Temporary residents of the City of Freeport may be eligible for a Temporary Residency Card. 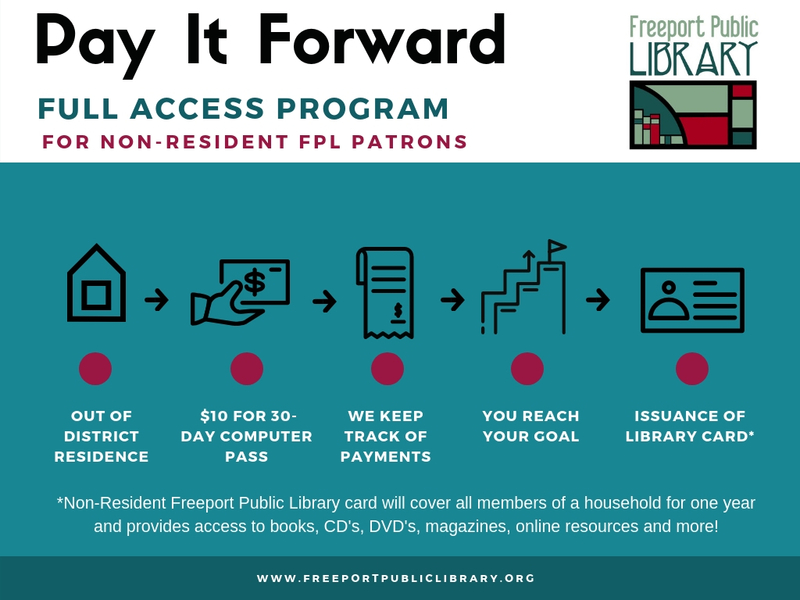 Non-resident FPL patrons may use the $10 guest pass toward the Pay it Forward Program for a non-resident card. WiFi access for personal devices is available to anyone in the building during open hours. Freeport Public Library card holders sign on using their library card number. Visitors receive guest passes at the Youth Services or Adult Services Desk. Adult computers may be reserved in advance by calling 815-233-3000 and asking for the Adult Services Desk. Computers provide access to the Internet and Microsoft Office 2010 Professional, which includes Word, Excel, PowerPoint, Access and Publisher. All online databases are also accessible on these machines. All public computers are linked to printers. Color copies are $.50 each and black/white pages are $.10 each.